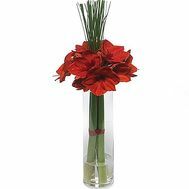 A bouquet of amaryllis is a symbol of attention full of symbolism. 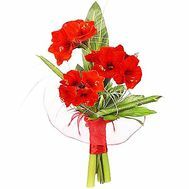 The flower of the amaryllis is considered a flower divine, endowed with charm and grace. According to legends, it is he who is the flower named after the nymph that created it. The original Amaryllis is a natural charm, a symbol of beauty and vulnerability. 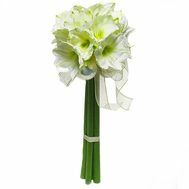 White amaryllis, according to the technique of feng shui, attracts positive energy to itself, gives its owner peace and creates a feeling of comfort. 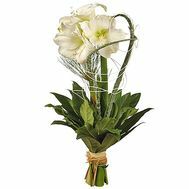 Amaryllis is hard to find in a flower shop, but our represents a huge variety. 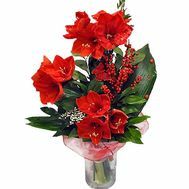 In addition, such a gift will be appropriate for both women and men: most often it is men's bouquets that are made with the help of this beautiful plant. 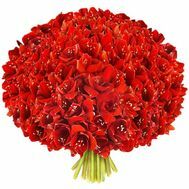 Present a bouquet of red or pink amaryllis to your father on February 23, emphasizing his masculinity and beauty. Or you can present it to your beloved mother on March 8, surprising with your approach to choosing a gift. 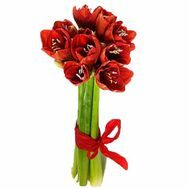 Where to buy a bouquet of amaryllis with free shipping? You can add an extra gift to the colors: sweets, toys, etc. And we also have the most democratic prices in Ukraine, and the abundance of discounts and stocks will please every customer! Delivery of flowers from our store is a service ahead of our time, and our courier delivers not just bouquets, but joy and true happiness.